Did you know that you can use headphones even if you use hearing aids? Advances in headphone technologies and in hearing aid technologies have created ways to use them both at the same time—and to use your hearing aids as headphones. There are generally three types of headphones that you can use if you are a hearing aid wearer. Bone conduction headphones do not make any contact with your ears. Instead, they sit in front of your them on your cheekbones. The transducers of bone conduction headphones send sound vibrations through your cheekbones to your cochlea, which is the spiral cavity of your inner ear that contains the organ of Corti that produces nerve impulses in response to sound vibrations. Bone conduction headphones ultimately leave your ears open and free, meaning that you can continue to wearing your hearing aid devices while also listening to music. Unfortunately, however, these headphones do not boast much power and their sound quality can be somewhat lacking. Other headphone options for hearing aid users include on- and over-ear headphones, which possess varying levels of power and sound quality depending on how much you are willing to spend. On-ear headphones are smaller and lighter than over-the-ear styles. Their name says it all: their padded headphones sit lightly on top of your ear, transmitting sound much more directly than bone conduction headphones. These headphones can have great sound quality and long-lasting battery. Over-ear headphones fit entirely around the ear, often creating a seal that is aided by noise-cancelling technologies. No matter what, people who use behind-the-ear style hearing aids may need to test multiple pairs of over-the-ear and on-ear headphones in order to find those that best fit around their hearing assistance devices. It is also important to be cognizant of an important issue regarding wearing headphones as a hearing aid user. Over-the-ear and on-ear headphones is that they can at times generate feedback with hearing aids, leading to annoying whirring, buzzing, and high-pitched noises. Noise cancelling headphones can often cancel out feedback issues, however. Headphones are not the only option for people with hearing aids who want to listen to music, podcasts, or to stream their favorite content. Hearing aid technology has in fact come a long way over the years, and there many models of hearing aids that have emerged with Bluetooth connectivity that allows you to connect directly to wide range of devices including cellphones and tables and even televisions. When hearing aids basically serve as your headphones, you can stream music, podcasts, in such, but that also allow you to take calls. Some hearing aids with Bluetooth connectivity include the Audéo B Direct from Phonak, the Oticon OPN, Resound Linx 3d, Starkey Halo 2, and more. These hearing aids often come with their own apps that you can download to your phone to control sound settings. While incredible technological advances have made it easier for people with hearing aids to use or integrate with headphones, there are important hearing health safety issues to remember. Researchers have established links between headphones use and hearing loss. In-ear headphones (otherwise known as ear buds) are a huge culprit for this, but many people who wear hearing aids are incapable of using those devices. No matter the headphone style, though, the problem remains listening to music at sustained, loud volumes. Audiologists generally agree that sounds over 85 decibels can cause hearing loss. To put that in context, most sounds heard in city spaces already exceed this decibel mark: garbage trucks can clock in at 100 dB, and cars honking their horns can reach 110 dB, whereas sirens such as those emitted by ambulances frequently reach 120 dB. These already loud noises more often than not cause us to turn our headphones up even louder than they already are, which can cause further, lasting damage to your hearing. No matter what kind of headphones you use, it is good practice to simply listen at 60% of maximum volume for a maximum of 60 minutes a day. If you are listening to something at a louder volume, decrease the time you spend listening. It may seem contradictory to think about hearing aids and headphones together. One of the devices has been linked with rising rates of hearing loss, whereas the other has helped millions of people worldwide to hear better. 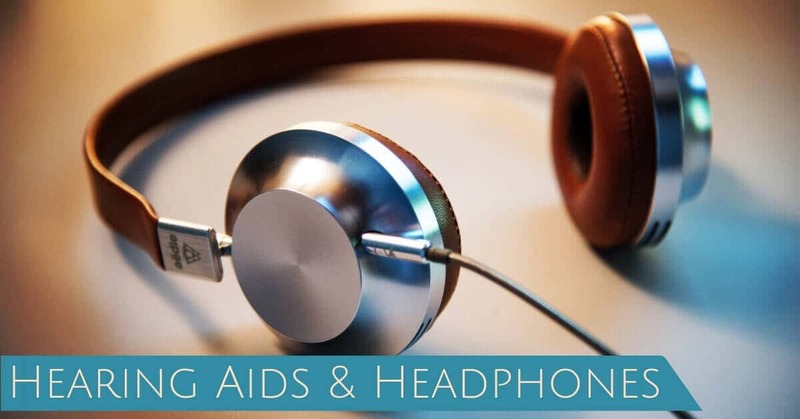 There are ways to balance your headphone use as part of a longer hearing health plan, and there are ways to use headphones as a hearing aid user. Thinking carefully about what your hearing needs are will help you to understand the best ways in which you can integrate headphones into your hearing aid usage. Are you experiencing changes in your hearing? Contact us at Hearing Group to schedule an appointment for a consultation and hearing exam.